I say cannoli, you say…ice cream?! Try envisioning cannolis and ice cream. 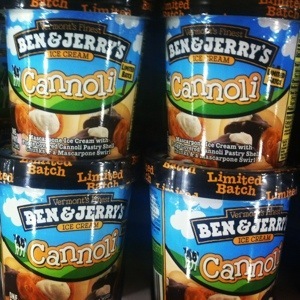 Ben and Jerry’s did, and they created a limited edition flavor called, you guessed it, Cannoli. It’s so limited people are tweeting about it when they find the flavor to #findcannoli. I first heard about this flavor about two weeks ago. 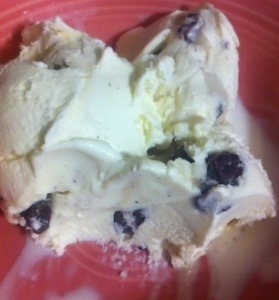 A friend of a friend posted a photo of a pint of this limited edition ice cream on Facebook and it spread. FAST. I had just started this blog and I knew I couldn’t just talk about this new flavor – I had to find it. Last week my friend Lisa spotted it in Big Y in Stratford and gave me the tip. I stopped by Thursday evening and brought home my very own pint. I’m slowly eating a small (yes, small) bowl of Ben and Jerry’s Cannoli ice cream as I write this. Just when you thought a cannoli coudn’t be anything else but a cannoli (and I mean really, why should it be? ), Ben and Jerry’s made it into an ice cream flavor. There is just enough sweetness so that the marscapone ice cream made with a marscapone swirl tastes very much like the traditional filling of a cannoli, but it is not overpowering. Is there a difference between Cannoli ice cream and a traditional cannoli? Not much. In fact, the difference I believe is due to the texture because you are eating ice cream and not the traditional cannoli filling, which has the consistency of frosting. Ben and Jerry’s Cannoli reminds me of “birthday cake” ice cream in the sense that the flavor is the same, so you will mostly likely say, “Oh, this ice cream tastes just like it!”, however the texture is not, and that is where the difference lies. The chocolate covered cannoli shell bits are the perfect finishing touch, and they are evenly dispersed throughout the ice cream, something Ben and Jerry’s is so very good at doing. Before I began eating my bowl of Cannoli I had concerns about what the chocolate chip-sized pieces of chocolate covered cannoli shell bites would be like – would they be the right size, would they be too hard, would I miss the amount of cannoli shell you get with a regular cannoli? The amount of cannoli shell bites in the pint were just the right amount. For people who like crunchy foods, like myself, I am pleased with the consistency of the shell bits. The chocolate covering keeps them from getting soggy and helps them maintain the consistency you would expect from a cannoli shell – a slight crunch, but with enough give that when you bite into it it doesn’t hurt your teeth and you are able to chew it. In other words, I think pro- and anti-crunchy food people will be satisfied with the cannoli shell bits in Cannoli. Ben and Jerry’s Cannoli ice cream solves one of my biggest foodie dilemmas; when faced with being forced to decide which I’d prefer – cannoli or ice cream? 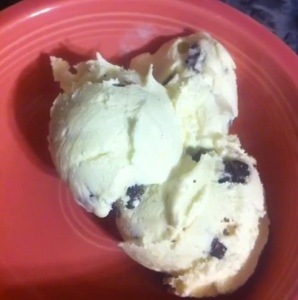 – this ice cream flavor allows me to have two of my favorites simultaneously. Thanks! I didn’t know about holy cannoli, off to do some more research. No judgement on age- I graduated high school in ’98 lol! I love what the tombstone reads for Holy Cannoli! I’m curious what you think about the newest cannoli flavor, have you tried it yet?